The story of these survivors – children and teenagers then, old men and women now – adds another chapter of inhumanity to the desperate times of the Holocaust era. Through the accounts of the participants, and the precise re-creation of the events by director Janet Tobias, this unusual scenario comes to life from a faraway time, in a faraway land. And beyond the event itself, it is about the gutsy discovery of a cave explorer and his curiosity, the initial telling of the tale in National Geographic magazine, and the driving interest from the director of the documentary to track down the survivors and have them relive the time. It is another lesson of the torture that genocide can inflict on humanity. Chris Nicola is a amateur cave explorer from New York City. In the 1990s, he decided to explore a chain of caves in the Ukraine, now an independent country but a battle zone during World War II. While in “Popowa Yama,” a grotto space deep in the cavern, Nicola discovered evidence that people had lived there – clothing, bottles and sewing items – and the items are all from the recent past. Curious, he does some research when he got back to the States. He found out that five Jewish families hid in that cave during the German occupation in 1942, to escape the fate of the concentration camps. He tracks down one of the survivors, Saul Stermer, and publishes the account in National Geographic magazine. Janet Tobias, an documentary director, finds the story and expands it with stories from the Stermers and the Dodyks, representatives from two of the five families that spent a record number of days underground. The two women, Sonia and Sima Dodyk, were little girls when they spent over 400 days in the dark pit. Their memories are about the sensory reactions – the lack of food and water, the bitter conditions of the cave, the fear of abandonment and the absolute darkness that they encountered through the endless days. They also remembered their less lucky relatives, in some of the hardest parts of the story. They survived a German raid by hiding, but still they had to face the seemingly endless dark days. The director Janet Tobias has a reporter’s approach to the story, gathering the facts and adding the re-creations of the events, in the distinct style of the History Channel (one of the producers). When we meet Chris Nicola, the discoverer of the grotto and the family’s story, he blithely retraces his steps to publishing the story in National Geographic. He’s not really an actor, and some of his re-creations are stiff, but it is quite fascinating that this unassuming cave explorer opens up a whole documentary simply because of his explorer’s curiosity. The nature of the story does lead to some redundancies, as the days in the cave extend to months, and then over a year. This is a talking head documentary, and is a bit more interesting when the actual people are telling their stories, and not when actors are re-creating it. 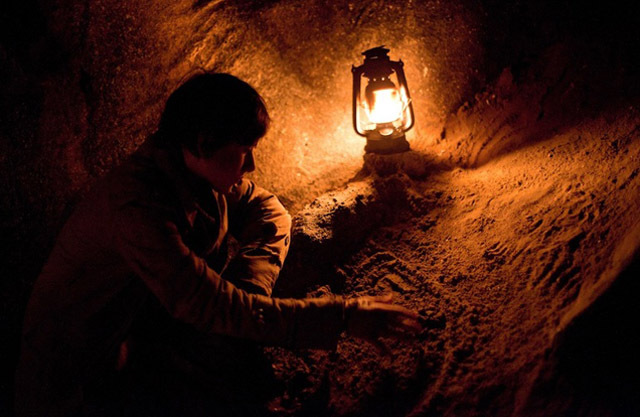 Tobias was careful to keep it as authentic as possible when using the dramatic substitutions, and seeks an empathy with the survivors by creating an atmosphere of low light and claustrophobia within the cave. Re-creations can be distracting in a documentary, and in this case there are a few points when the events become disconnected from the actors replaying them. But still, this is astonishing stuff, in the aspect of survival, family and homeland. No matter how many times the Holocaust is reexamined, there are still stories to unearth and a dwindling number of survivors to tell them. “No Place on Earth” lives up to its lofty title, as the horror of a modern genocidal regime keeps echoing through the lost souls of six million human beings.